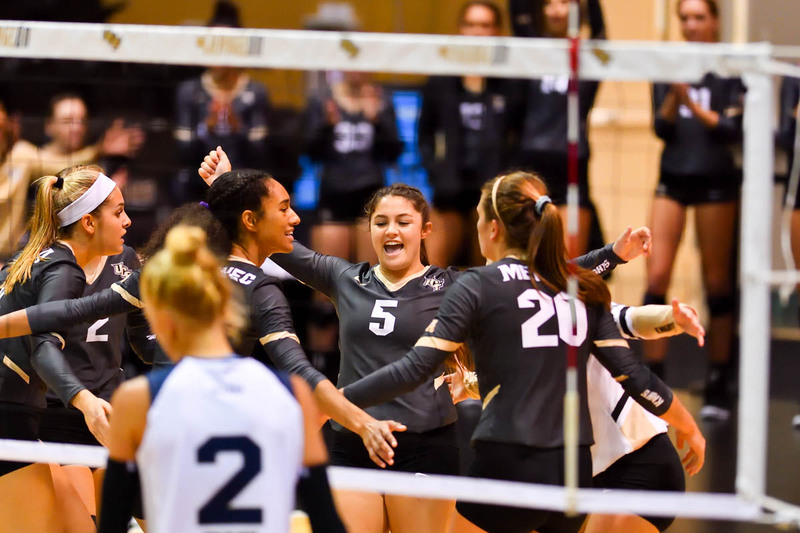 For the first time in university history, UCF's Volleyball team was ranked the No. 13 and will host the NCAA Division I Volleyball Tournament this week. For the first time in program history, the NCAA Division I Volleyball Tournament is coming to UCF. On Sunday night at a selection show watch party at Burger U, the Knights were tabbed as the No. 13 national seed in the 64-team tournament, also a program first. UCF will face Florida Gulf Coast on Thursday in The Venue. In the other side of the bracket, Florida will face Florida State. The winners of the two matches will meet at 7 p.m. on Friday. Tickets for all matches can be purchased online. The Knights are in the midst of a historic season. The Black and Gold enters the postseason riding a 24-match winning streak and a 27-3 record overall. The champion of the American Athletic Conference, UCF went a perfect 18-0 to clinch the league title, becoming just the third team to go undefeated in the league’s history. Last month, the Knights moved into the American Volleyball Coaches Association Coaches Poll for the first time in program history, moving up to No. 21 nationally two weeks ago. UCF has exceeded expectations all year long. Picked to finish fifth in The American, and consistently featuring a starting lineup with six underclassmen, the Knights have one of the most balanced programs in the nation. The Black and Gold led The American in assists, kills and blocks. Freshman outside hitter McKenna Melville has been a force to be reckoned with this season, as the rookie ranks 15th and 16th in the nation in kills and points per set. Fellow rookie Kathryn Wesolich is closing in on the single-season block assists record, and lone senior Jordan Pingel, who has already smashed the program’s career digs record, needs just two saves to break the single-season record.